Watching any film from the silent era (1900-1929 ) is a little like looking in on an alien world. The things that might be seen as exotic to the original viewers pass unnoticed, and the unimportant details are so strange to our eye that we see only them. This is even more apparent when the silent film itself was made as a window onto an alien world. The modern viewer may glide right by the same Japanese sets and costumes that amazed the original audience but then be stymied by a white man unconvincingly playing an elderly Japanese master artist, or the hero painting in a well known national park. The fact that The Dragon Painter is a 1914 silent film is the first of four critical things you need to know about this DVD. The second is that it stars a very young Sessue Hayakawa, the same man who 43 years later would receive an Academy nomination for his role as Col. Saito in David Lean’s Bridge on the River Kwai. Thirdly, it is an American film that was for the time atypically non-racist in its depiction of the Japanese, perhaps because Hayakawa produced the film himself and was co-owner along with director William Worthington of the production company (Haworth) that made it. Lastly, this is an amazing restoration of a heretofore lost film. The restoration aspect alone makes this DVD worth watching. The Dragon Painter is based on the novel of the same name written in 1906 by Mary McNeil Fenollosa. It is about the brilliant but insane Japanese painter Tatsu (Hayakawa) whose madness is also the source of his genius. Kano Indara (played in “yellow face” by Edward Peil Sr.) is the aging master painter who hopes to make Tatsu his pupil and heir. To this end, Indara tricks Tatsu into believing that Indar’s daughter Ume-Ko (Tsuru Aoki, who was Hayakawa’s real-life wife) is the hallucinatory “princess” who Tatsu is searching for in his painting. But if Tatsu finds what he has lost, will he still be able to paint masterpieces? And after Ume-Ko falls in love with Tatsu, will she just selfishly stand by while he wastes away, unable to paint again? I think you may see where this is all headed. There are some hurdles for the modern viewer to overcome in watching The Dragon Painter. Much of the film was shot in Yosemite, whose monumental and fantastic scenery is meant to stand in for the idealized Japanese style of landscape painting — and it is indeed an amazing landscape. But it is obviously not Japan any more than if the film had been shot in front of the Statue of Liberty. And the acting in silent films often seems too exaggerated to modern viewers. Hayakawa and the others do conform to that norm. Hayakawa is precise in his manic portrayal of Tatsu. His version of Japanese intensity would have caused a stir in 1914, although anyone who has seen something like Seven Samurai would not think it unusual. Never the less, The Dragon Painter is very forward looking and the wonder of it is that this film is almost 100 years old. It wasn’t that long ago that Bruce Lee could portray Kato the Japanese house servant to The Green Hornet and no one in the mostly white American TV audience would bat a round blue eye. Chinese? Japanese?... what is the difference? In 1914 the situation was even worse. White actors could and did portray any other racial group (for instance Warner Oland as Charlie Chan), and as noted above, one of the main characters is a Caucasian in “yellow face.” What sets The Dragon Painter apart is its authenticity of sets, costumes and predominately Japanese cast who are portraying real people and not stereotypes. It is also probable that the same unique racial POV is what obscured this film. The American audiences liked their Asians to be pyschopathic Fu Man Chus or comic laundrymen and cooks. Though popular in the teens, Hayakawa fell into obscurity with a rising tide of anti-immigration laws aimed at Asians and the Japanese in particular in the 1920s. He left the U.S. and moved to Paris where he lived through the war. According to the accompanying notes, he was brought back to the States by Humphrey Bogart (a long time fan of Hayakawa’s) in 1947 where he resumed his Hollywood film career. The Dragon Painter belongs to a whole world of silent film that remains generally unknown (I certainly had never heard of it before now). That world was swept away by the twin tsunamis of talking films and the Great Depression. With a few exceptions, those films are lost. But with the release of this DVD that loss has been lessened. This was an unusual film when it was made and it remains so today. 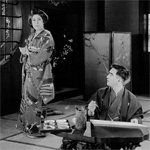 Included as a bonus feature with The Dragon Painter , is a second Japanese-themed American film from 1914, The Anger of the Gods, also starring Sessu Hayakawa and Tsuru Aoki. It was directed by Reginald Barker and produced by Thomas Ince, a leading (and notorious ) figure in the early years of American filmmaking. The inclusion of this film from the George Eastman House collection is an excellent opportunity to compare styles of similar themes from the same time. And the fact that Hayakawa and Tsuru Aoki are both in it adds to the comparison. But wait there’s more! 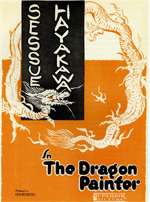 Milestone Films has also added a set of PDF files of additional notes and a press kit for The Dragon Painter; an excerpt from a forthcoming book on Thomas Ince entitled “Hollywood’s First Asian Cycle”; the entire screenplay for Wrath of the Gods; the complete novel ‘The Dragon Painter’ with original illustrations; and a 5 minute comedy short with Hayakawa, Rosco “Fatty” Arbuckle and Charles Murray. What a deal! The wonderful restoration of The Dragon Painter is one of the main selling points of this DVD and it is simply amazing. If it has one weak link, it might be the modern soundtrack that has been added. The music itself is top notch and accompanies the film perfectly but is still a modern addition. If you find the music not to your purist tastes, you can always turn the sound off. An intriguing option might have been to have included an audio version done in the manner of the original Japanese silent films where an accompanying speaker provided voice over and narration. As with any silent film, The Dragon Painter and The Wrath of the Gods should be watched on their own terms. Remember they were not made for modern audiences yet still have something to offer us if you will meet them half way. Also, be sure to read the additional notes. If you go into the film without the back-story, you’ll miss half the fun.